Exceptional photography – team that up with top of the line motoring and one gets an epic combination of style, class and charisma. Here’s a quick run up of a shoot we did early in January 2013 which has got us on the world map. Ever visited a quarry? We did, epic thanks to our friend and fellow motoring enthusiast Vikram Dhoot. Dust, grime and amazing chicken curry led to the shots you will see below. We decided to go four wheeled this time! We spent the day (and night) at this mammoth mortar making quarry. Not only were we breathing through our T-shirts all the time but this shoot was a proper dust test for our equipment as well. We had quite a few cars lined up as part of this shoot but today we talk only about one very special machine. The vehicle is a 1980’s Mercedes Benz W123-200. Enjoy. As the Sun set, we finished our tour of the premises and settled down for a spot of tea (we love our tea!). Our team now consisted of one photographer and more than ten accompanying enthusiasts. We slotted the Mercedes sedan for the night. It was essential to take the surroundings into our photographs. The amount of dust on the vehicles was also something we tried working into the shots. The image is alive. So is the processing plant at the quarry. We shot this image at about 12am and boy, was it an experience! The sky was at its acme of clarity and so the following picture was inevitable. This was a welcome change from our usual motorcycling infused travel photography. We tested a bunch of new camera equipment too, the pictures you see here are all shot with a brand new Nikon D800! Check out the view! The epitome of 80’s motoring in India! If you haven’t already noticed, the car is a Left Hand Drive W123-200. This particular car is a 2 litre, four cylinder petrol. From North America and across the world to Japan, this car has seen almost every terrain the world can offer. 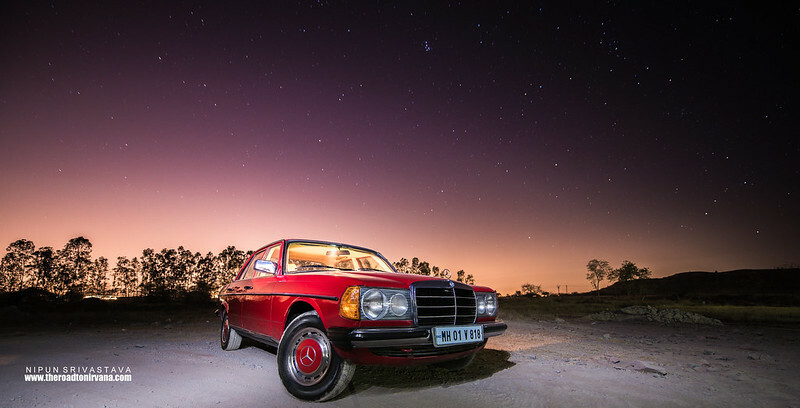 The W123 was the most popular Mercedes sedan of its time, selling more than 6 million units! Which brings us to our next photograph. In one day, this photograph championed more than 40000 likes and favourites on Facebook and Instagram. This one image registered more than two million views. Mercedes Benz, Stuttgart, themselves pinged us and asked for the picture. This, friends, is the next step. These pictures have now gone on to become the face of Mercedes Benz Museum’s Classic car photo competition! Like the Mercedes Benz Museum facebook page HERE. They even named the Photography competition after our article! Enjoy! The motorcycle men and women of the Firelords – for their ever awesome, ever annoying and forever dear to us assistance. Vikram Dhoot – for the hot food, his car and his quarry. Mercedes Benz – for their fantastic motoring. If you have an awesome car and want awesome photography, get in touch! This entry was posted on March 20, 2013 by Nipun Srivastava. 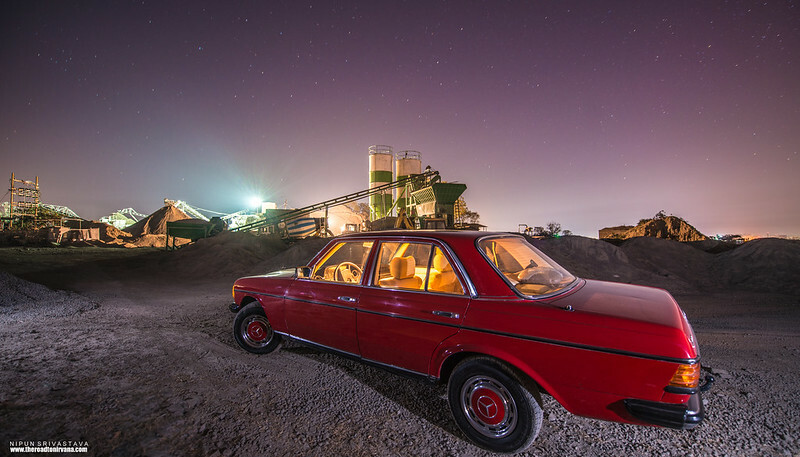 It was filed under Photography and was tagged with car, d800, dust, evening, Mercedes, Mercedes Benz, motoring, night, nikon, sedan, sky, stars. Hats off sir …..Great work.